A few additions and corrections to my earlier post about J5 @ the Goodlife cafÃ©. Jurassic 5 was formed from two crews coming together: Rebels Of Rhythm (Nu-Mark, Zaakir and Akil) & Unity Committee (Charli 2na, Cut Chemist, Mark 7, Jahli, Kemit, Longevity and Metalogik - the 4 mentioned last are members of the still active crew Darkleaf). They met at the Goodlife cafe where they held talent showcases every Thursday night. Both crews performed there the same night (by coinsidence? ), liked eachother's sets and hooked up (reveals an interview on Bombhiphop). 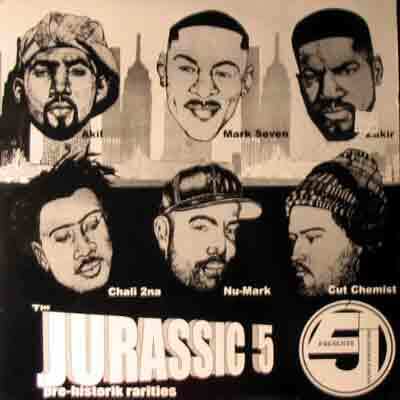 They didn't use the name Jurassic 5 until their first record contract. Their first single "Unified Rebelution" came out in 1994 which was self-released. In '95 it was re-released by Blunt Recordings and that's when the name Jurassic 5 first appeared. Thanks for my man Iwere for the knowledge. He also corrected me that, to his knowledge, the name Project Blowed wasn't used until they moved from Goodlife cafÃ© to Kaos Network. Just as I've been wondering how come there are no old demos and Goodlife CafÃ© recordings of Jurassic 5 around (yes, J5 too originates from Project Blowed nights at the Goodlife), I ran into this double-LP. It includes some of their early recordings and rare collabos. I was especially thrilled about the song "Evolve or Dissolve" that's on Jizzm's Illasophic Vol. 1 cassette which is one of the dopest tapes. It's produced by Slant, and features Jizzm, Slant, J-Smoov, Akil & Chali 2na. Like I wasn't lucky enough just finding this 2LP, there was a third record inside the sleeve for an unknown reason - the J5 EP. All love for The Funkiest record shop, big up! Check this Goodlife recording of Chali 2na from 92-93. I dig the part where he goes "They call me 2na, as in fish in sea/ self-efficiency/ that's my mission, see/..." which he later used on the song "In The Flesh" on their first EP in '97.